Whitney Narrow Font Features: Stylistic Sets | Hoefler & Co.
Whitney Narrow takes advantage of Stylistic Sets, an OpenType feature that makes it easy to transform text with a single click. Many fonts contain stylistic or functional variations of individual glyphs, commonly known as “alternates.” When using such fonts, designers have traditionally had to hunt for these characters in a vast palette of glyphs, from which individual characters could be inserted, one at a time, into the text. 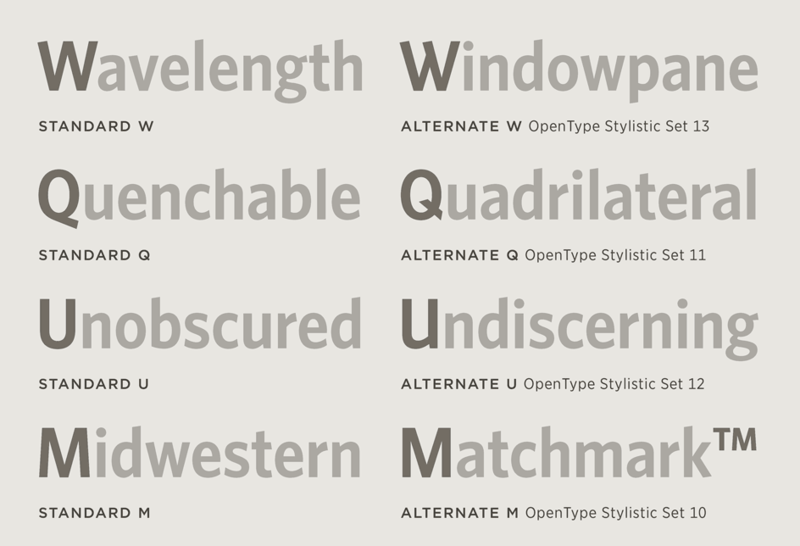 OpenType fonts, when used in a type-savvy application, offer a much more convenient approach: related alternates can be grouped together as “Stylistic Sets,” which when activated will render all the changes at once, throughout the selected text. Below are some of the Stylistic Sets we’ve created for Whitney Narrow, accessible in the Adobe Creative Suite, the Cloud.typography webfont dashboard, and other supporting applications. All proper typefaces include “smart quotes” that are differently inflected. In standard English usage, open quotes point up and into the beginning of the line, and closed quotes point down toward its end. In keeping with its contemporary style, Whitney Narrow reduces these forms from their dainty “66” and “99” to a pair of trim darts. Designers can reintroduce curved forms by invoking Stylistic Set 17, which alters the look of all the quote-shaped characters: the open and closed single quotes, double quotes, and baseline quotes, as well as the comma and semicolon. One of Whitney Narrow's signature motifs is the angled terminal, which adds energy to the line by shearing certain strokes 9° out of plumb. Designers can quiet the fonts by activating Stylistic Set 1, which flattens these details wherever they appear. Since angled forms recur throughout Whitney Narrow’s character set — in capital and lowercase letters, accents, numbers, punctuation, and symbols — activating this set changes a total of 231 characters in each font style, all in a single action. 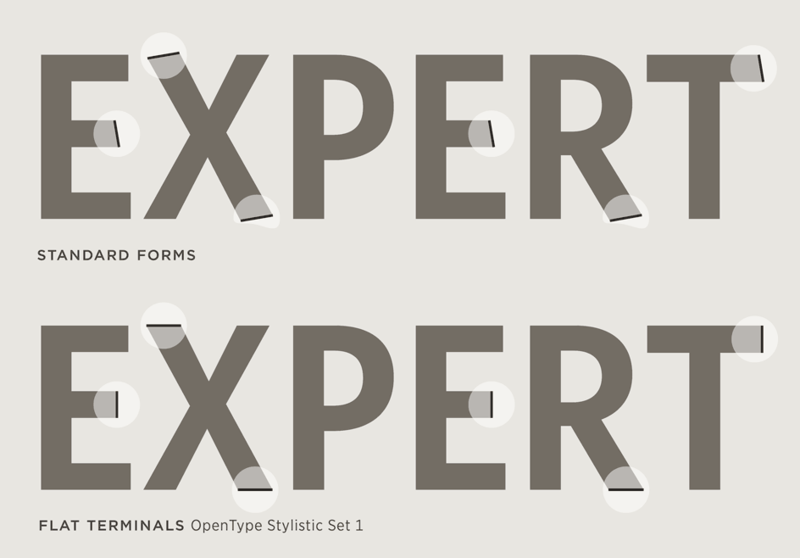 Some of Whitney Narrow’s alternate characters are distinctive enough to change the complexion of the design. The center of an alternate W intersects not at a peak but with a dado joint, the tail of an alternate Q stops short of the baseline, an alternate U features an asymmetrical form reminiscent of calligraphic uncials, and an alternate M has fully vertical sides. Instead of selecting these characters individually from the glyph palette, use Whitney Narrow’s Stylistic Sets to ensure that all related forms are employed together. Each of these alternate capitals has implications for the small caps, the accents, and even related alphabetic symbols such as trademark and servicemark. Whitney Narrow’s lowercase g follows the customary two-storey form, but Stylistic Set 14 offers a simplified single-storey alternate. A dubious but popular belief holds that single-storey letters are easier for children to read — presumably because they’re easier to write — but simplified forms are more legible in environments that are too coarse to render the nuances of the more complex traditional form. Whitney Narrow’s single-storey g is useful at small sizes (legal disclosures, ingredient lists, small package inserts), when printing on non-porous substrates (credit card backs, pharmaceutical labels, product indicia), and most especially on computer screens limited by size, resolution, or both. Inversely, Stylistic Sets 8 and 9 replace the italic’s traditional single-storey a and g with two-storey forms, correlating with the shapes in the roman. These two small changes can dramatically affect the timbre of the design, turning Whitney Narrow’s polite and approachable cursive into a keen and insistent oblique. Such changes in tone can be especially useful when designing a wordmark, or any other piece of typography designed to be seen in isolation.